Does WD need cartoon characters to reinforce brand recognition? 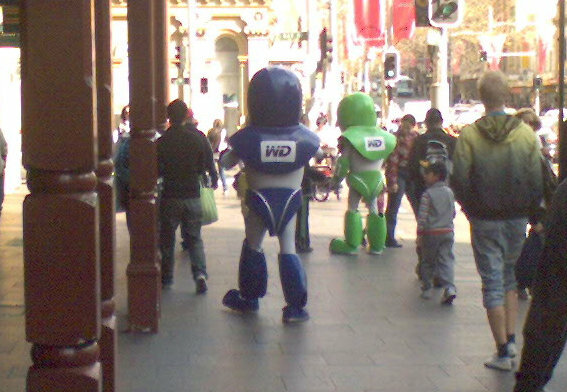 Outside Capital Square in Sydney CBD today there were 3 mangaesk character. All emblazed with WD logos. ie promoting Western Digital. Looking like something you might see in Tokyo, manga style characters walking around, handing out trinkets to add to your keitai (mobile phone). But what is the point? Really, how many people are going to walk by and notice them? And know what they are? My first impression was they were there to increase brand recognition. Most people just think about what size hard drive they have, not what brand it is. So why not make people brand aware? But it appear there are other motives too. I found on OzBargin a promotion of WD hard drives, that requires you to buy from a store at Capital Square. So, they were there to entice people into one of the computer shops to take advantage of the current off. I don’t think it was working though. No signage explaining the point of the characters. Or the availability of the promotion. Lots of people took their photo with them. And they are recognised on at least one blog. So maybe it worked best for brand recognition. 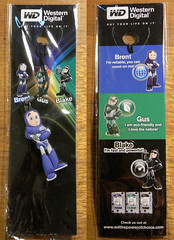 This entry was posted in Photos, Tech and tagged brand, character, HD, Manga, photo, WD, Western Digital. Bookmark the permalink.